Based on an exceptionally well-preserved articulated postcranial skeleton, the early amniote Cabarzia trostheidei gen. et sp. nov. is described. As the lack of the skull hampers its taxonomic assignment, a large sample of basal amniotes is included as part of an exhaustive comparison. Considering the slender, long-limbed proportions of the skeleton, several potential determinations are suggested in order to test for bolosaur, millerettid, araeoscelid, basal neodiapsid, or synapsid affinities. Numerous character conditions are re-evaluated regarding their distributions among early amniote subclades. The closest match to Cabarzia is found to be the middle Permian Mesenosaurus from Russia. The documentation for both genera provides the most complete postcranial descriptions of non-varanodontine varanopids. One of the main differences from Mesenosaurus is the curved ungual phalanx, indicating a use related to predatory behavior. An investigation of limb proportions, such as slender trunks, elongated hindlimbs, and relatively short forelimbs, may suggest the occurrence of facultative bipedalism in Mesenosaurus and Cabarzia. The oldest known mesenosaurine, C. trostheidei from the Asselian/Sakmarian, also pushes back the oldest evidence of bipedal locomotion by more than 15 Ma. The online version of this article ( https://doi.org/10.1007/s12542-018-0439-z) contains supplementary material, which is available to authorized users. We owe a great debt of gratitude to Frank Trostheide (Wolmirstedt and Magdeburg) for transporting, loaning, and facilitating the public cataloging of the newly described specimen, as well as for valuable discussions. The documenting carried out in Moscow was greatly facilitated by Ilja Kogan (Freiberg), Evgenia Sytchevskaya, Lev S. Schatenstein, and Valeriy Golubev (Moscow), who provided travel assistance, accommodation, supplies, and collection management. We are grateful for our constructive exchanges with Johannes Müller (Berlin), Michael Buchwitz (Magdeburg), Sebastian Voigt (Thallichtenberg), Thomas Martens (Gotha), and Diane Scott and Robert Reisz (Mississauga). Nico Schendel (Freiberg) kindly assisted with the literature search for the limb plates. Marcel Hübner (Freiberg) and Steffen Trümper (Chemnitz) provided images for the geological map and outcrop documentation, respectively. Stephan Brauner (Friedrichroda) helped by contributing his immense and detailed knowledge regarding local mining history, geology, and re-identifying the horizon of the new holotype. Furthermore, we greatly appreciate the English language help given by Eleonore Horlacher as well as the general funding provided by Michael Völker and Raimund Albersdörfer (Dinosaurier Museum Altmühltal, Denkendorf). The manuscript profited considerably from the kind reviews of Stuart Sumida, Neil Brocklehurst, and one anonymous expert. This research was supported by the Deutsche Forschungsgemeinschaft (DFG grants SCHN 408/12, 20, 21, and 22 to J.W.S.) as well as by the Russian Government as part of the program ‘Competitive Growth of Kazan Federal University Among World’s Leading Academic Centers.’ This work represents a contribution toward the tasks of the IGCP Working Group on Nonmarine-marine late Carboniferous, Permian and early Triassic correlations. Schneider, J.W., and F. Scholze. 2016. Late Pennsylvanian–Early Triassic conchostracan biostratigraphy: a preliminary approach. In The Permian Timescale, eds. S.G. Lucas, and S. Shen, Geological Society, London, Special Publications 450. https://doi.org/10.1144/sp450.6. Spindler, F. 2015. The basal Sphenacodontia—systematic revision and evolutionary implications. PhD thesis. Freiberg: Technische Universität Bergakademie Freiberg, 1–385. http://nbn-resolving.de/urn:nbn:de:bsz:105-qucosa-171748. Spindler, F., R. Werneburg, J.W. Schneider, L. Luthardt, V. Annacker, and R. Rößler. 2018. First arboreal ‘pelycosaurs’ (Synapsida: Varanopidae) from the early Permian Chemnitz Fossil Lagerstätte, SE Germany, with a review of varanopid phylogeny. PalZ 92(2): 315–364. https://doi.org/10.1007/s12542-018-0405-9. Tsuji, L.A. 2010. 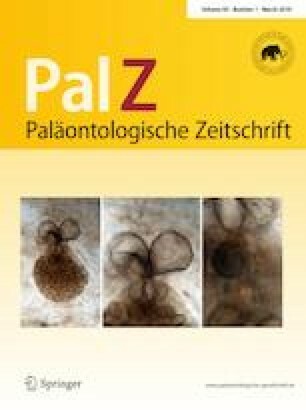 Evolution, Morphology and Paleobiology of the Pareiasauria and their Relatives (Amniota: Parareptilia). PhD thesis. Berlin: Humboldt-Universität Berlin, 1–220. https://edoc.hu-berlin.de/handle/18452/16918.